The publication of an article in the “Journal of Engineering Science” is an essential building block in the development of a coherent and respected network of knowledge. It is a direct reflection of the quality of the work of the authors and the institutions that support them. Peer-reviewed articles support and embody the scientific method. Therefore, it is important to agree upon standards of expected ethical behavior for all parties involved in the act of publishing: Author, Editorial Board, Reviewer and Publisher (Sumy State University). Our position on the ethics of publishing based on COPE’s Best Practice Guidelines for Journal Editors. It is essential that all parties involved in the act of publication (authors, reviewers, and editor), to agree with the following provisions. Our position regarding the publication ethics in the “Journal of Engineering Sciences” is based on the requirements laid in the guide COPE’s Best Practice Guidelines for Journal Editors. The journal allows the author(s) to hold the copyright and to retain publishing rights without restrictions. the originality of the work. The Editorial Board will not disclose information about a submitted manuscript to anyone other than the corresponding author, reviewers or potential reviewers, or other members of the editorial board. Editors will ensure the prompt handling of the review process. Editors will evaluate the merit of manuscripts for intellectual content without regard to race, gender, country of origin, ethnicity, religion, or sexual orientation. if a potential reviewer feels unqualified to review the manuscript, that reviewer should notify the editors immediately and decline the review. Manuscripts received for review will be treated as confidential documents and not shown or discussed with others without authorization from the editors. Authors should expect to receive reviewer reports in a prompt manner, normally within three weeks. Reviewer misconduct (breach of confidentiality, delay of peer review, plagiarism, or conflicts of interest) will not be tolerated. all sources of financial support should be disclosed. Authorship should be limited to those persons who have made a significant contribution to the work in terms of conception, design, experimental implementation, and data analysis and interpretation. All persons making significant contributions should be included as co-authors. If an author discovers a significant error in the published work, the author is obligated to inform the Editorial Board of the “Journal of Engineering Sciences” in order to either correct or retract the paper. In cases of proven scientific misconduct, plagiarism, or fraudulent publication, the Publisher (Sumy State University) in close collaboration with the Editorial Board will take appropriate action to clarify the situation, publish an erratum, or retract the work in question. The editor decides which manuscripts are to be published in the journal. Editor in his activity takes into account the aspects of the policy of the Editorial Board, the legislative acts, the rules on the elements of libel, copyright infringement, and plagiarism. To decide, the editor can consult the members of the Editorial Board or the reviewers. The editor always evaluates the manuscripts exclusively based on the content without taking into account the issues of race, gender, sexual orientation, religion, ethnic origin, nationality or political opinions of the author. Editor and all members of the Editorial Board shall not divulge information about manuscripts submitted to the journal. The author only is entitled. Editor and Editorial Board can only provide information about potential manuscript reviewers, editorial consultants depending on the circumstances. The information, contained in unpublished manuscripts, should not be used in editorial work without written permission from the author. Authors must submit a truthful description of the completed research and an objective assessment of the significance of the results of the work. The main information must be exactly presented in the paper. The article must contain real information and references in sufficient volume as the results of the investigation would be possible to replicate. Providing false or deliberately imprecise information is considered as unethical and unacceptable. For evaluation, it is proposed to authors to submit together with the manuscript the original and primary data, which should be ready for open publication (in accordance with the Association of academic and professional companies to publishing data and databases). Authors are invited to keep the original information concerning investigations conducted within a reasonable time from the date of publication. The authors undertake to guarantee the originality of their scientific papers and in a case when the author includes the statements or results of investigations obtained by other authors (third parties), these must be referenced in the paper. The author should not publish the results in more than one journal. Simultaneous presentation of the manuscript in two or more journals is viewed as something unethical and unacceptable. All materials borrowed in the manuscript should contain links concerning authors. The authors undertake to include references to studies that have determined the direction and character of the presented work. List of authors should include only those persons who have made a significant contribution to developing the concept, content, and preparation of the article. Persons who have contributed less should be listed as co-authors. If there are persons who have made a significant contribution to the achievement of certain divisions of work, they must be mentioned as persons who have contributed to the manuscript preparation of scientific work. The group’s representative is obliged to familiarize with the final version of the article all persons who made the respective contributions and to obtain their agreement about the estimation of the degree of their contribution to this work. All authors must not present in manuscript any financial information or other material that could have an impact on the interpretation of the results of scientific investigation. It is prohibited indicating the sources of funding conducted a scientific investigation. If the author has found in his published article some significant error, he is obliged to notify promptly the editor or the editorial board, to contribute to correct the error or to delete the article. To ensure the quality of published materials and to respect the copyrights, all articles received by the editor are tested for plagiarism using the software “Anti-plagiarism” and only after this procedure the article is sent for review. The position of the journal on promoting anti-plagiarism policy, information about test items on loan segment of the edited articles and the measures of the editorial board on screening cases considered as plagiarism are formulated and presented in the section “Anti-plagiarism Policy” of this guide. 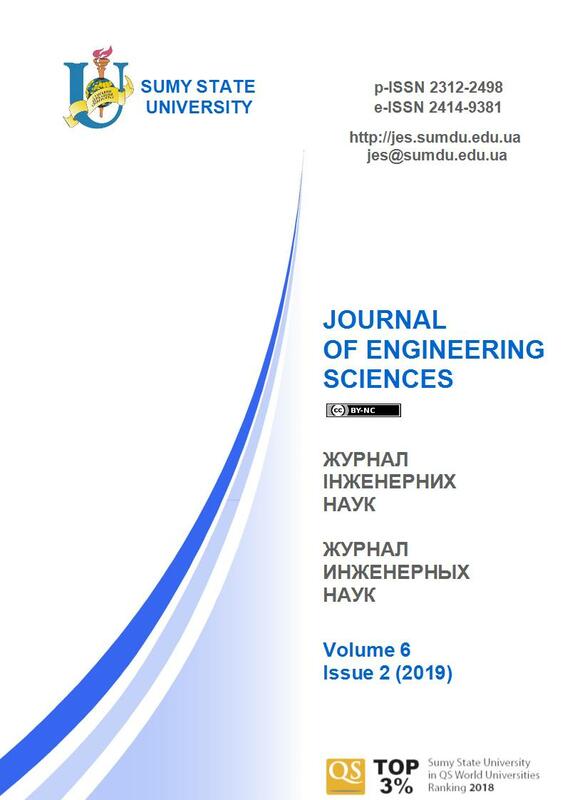 Editor and Editorial Board of the “Journal of Engineering Sciences” requires all authors, who wish to publish their articles in the journal, to become familiar with this information. Any reviewer who feels the lack of proper skills to review the results of scientific research presented in the manuscript or knows that he can not prepare in time its opinion on the manuscript, must inform the editor and refuse to perform the act of reviewing. All manuscripts received for reviewing must be treated as confidential documents. They should be shown or discussed with third parties only with the permission of the publisher. Reviewing the manuscript must be objective. Personal critique of the author is not allowed. The referent must expose his own opinion clearly with its strict argumentation. The reviewers should identify the works on related topics with investigated problems, but not mentioned by the author of the manuscript. Any statement on some findings, conclusions or arguments that are elucidated in the literature needs to be confirmed by reference to relevant literature sources (relevant links). The reviewer is obliged to inform the author of the manuscript about finding a similarity or overlapping between the evaluated work and other scientific publication which is known to the reviewer. Information indicated as confidential and ideas that can be generated in the evaluation process of the manuscript cannot be divulged or used for personal purposes. Reviewers may not evaluate manuscripts in the case when their content presents a conflict of interest with their work as a result of competition, partnerships or other relationships with at least one of the authors of the manuscript, company or organization that have some attitudes concerning the manuscript. The qualitative foundation of science is its reliability. All the readers should be guaranteed that authors of publications present the results of their research in a clear, reliable and honest manner regardless of the fact whether they are the direct authors of publication or they took benefit of specialized help (natural or legal person). In this case, the openness of information on any party contributing to the preparation of a publication (content-related, material, financial, etc.) is proof of ethical attitude of a research worker and of high editorial standards and that is an indication of both good practice and social responsibility. Ghostwriting is a situation where a person contributes significantly to a publication and is not disclosed as one of the authors or named in the acknowledgments. Guest Authorship is a situation where an author’s contribution is insignificant or non-existent and he is still listed as author/co-author of a publication. The Editorial Board requires authors to disclose contribution of individual authors to the preparation of a publication (with a list of their affiliations) in detail, i. e. provides information on who is the author of concept, premises, methods, protocol, etc. used in the publication. Main responsibility to disclose full information remains on author submitting manuscript. The Editorial Board explains in the Instructions for Authors that Ghostwriting and Guest Authorship are indicators of scientific dishonesty and all cases will be exposed and adequate institutions will be informed (employers, scientific societies, scientific editors associations, etc.). The Editorial Board acquires information on sources of financing of a publication, financial contributions of research institutions, scientific associations and other (financial disclosure). The Editorial Board documents all the indications of scientific dishonesty especially of violation of ethical principals followed in science. the use of materials without written permission from the authors or copyright holders, if they prohibit the use of their materials without special agreement on their part. The articles containing less than 85 % of the original text are not published in the journal. The Editorial Board does not welcome the use of an excessive number of citations, although properly presented. The allowable volume of admitted quotes must not exceed 30 % of the total volume of the article. Reviews and other articles, that require (by objective reasons) a large number of citations, will be examined by the editorial board individually. The Editorial Board does not welcome practices of publishing articles, the content of which fully meets other scientific material published by the author (Ph.D. thesis, synopsis of doctoral theses, monographs). All articles published in the “Journal of Engineering Sciences” pass the testing procedure with the software “Anti-plagiarism” in order to detect the presence of texts from the Internet (through search engines). In the case when there are some doubts regarding the originality of the text of the paper, the Editorial Board uses additional tools to track borrowings. Texts in foreign languages are checking by the search engine UniCheck and other similar instruments. Authors can check their articles themselves on plagiarism using the following tools: “Small SEO Tools”, “Plagiarisma”, etc.